When I was a senior in high school, I had the opportunity to teach a kindergarten class. I spent days designing the lesson, and I will never forget the look of excitement in the eyes of the students as they participated in the lesson I created. A seed was planted; I wanted to become a teacher! All teachers are responsible for inspiring students to contemplate and investigate career pathways as well as promoting college and career readiness. Teaching is one of those careers. The U.S. Department of Education reports teacher shortages throughout the nation in all geographical areas, subject areas, and grade levels (U.S. Department of Education, Office of Postsecondary Education, 2015). While grow-your-own strategies have included initiatives, such as alternative licensure programs, formal efforts have not included the classroom teacher in the recruitment of future teachers. Teachers of all grade levels have the expertise to grow-their-own through purposeful efforts. Identify potential educators and plant the idea in their hearts and minds. Ask if they have ever considered becoming a teacher, then follow the question with specific, descriptive feedback on why they think they could be a successful educator. Encourage capable students from kindergarten through 12th grade. Include parents and guardians in the mission. During formal and informal conferences, share why their child would be a successful educator. Collective efforts produce an abundant harvest. Use “yes . . . but” in conversations to emphasize the positive aspects of the profession. Make it a practice to follow a voice of concern with a statement on the joys of teaching. Be mindful of how encouraging messages about teaching can influence a student who is entertaining the thought of teaching. Consider how your reactions to the challenges of teaching enhance and contribute to the grow-our-own approach. All careers have challenges, yet students in the public schools typically do not regularly interact with other career professionals nor do they hear about their difficult times. Teachers are part of a student’s daily life. Consequently, explicit positive messages are important during difficult times. Share your story. Reveal the motivation behind becoming a teacher whenever the opportunity arises. Describe the events and special people who inspired the decision. Telling one’s own story inspires prospective educators and serves as a reminder as to why you entered the field. Reconnecting to your vision of teaching revitalizes your spirit and strengthens your mission of inspiring others to consider teaching. Share the chapters of your teaching life so that your students might begin writing their own. Create opportunities to explore teaching. Ask students to serve a mini apprenticeship as a teacher’s helper for a day or a week. During this time, reveal the positive aspects of a career in teaching. At the end of the apprenticeship, recognize the student with a certificate, a tangible reminder of the special event. This guided practice enables students to discover the enjoyment of planning lessons and making a difference in the lives of others. Students also can be assigned to work with teachers in the younger grades to build confidence in working with others while experiencing education from the teacher’s side of the desk. Student organizations, such as Educator Rising, provide the framework and support to encourage a career in education. Furthermore, Educator Rising promotes interest by allowing high school students to “test-drive” teaching and empowering teachers to act as ambassadors for teaching (Brown, 2016). These ongoing opportunities for practice exposes students to the enjoyment of planning lessons and making a difference. Think like a marketing agent and visually promote your profession. Positive messages in the classroom can inspire future educators. Posters that celebrate teaching and the power of learning can motivate students to consider a career as an educator. Highlight successful teachers on a bulletin board or in published news articles. Have students create works about teachers who have influenced them. Be a role model. Attract students to teaching by simply doing what you love to do: teach. Be the professional your students want to emulate. Welcome your students at the door with a smile. Facial expressions, attitude, and social interaction become your runway moves. Positive actions and reactions serve as fertilizer that encourage students to perceive education as a desirable calling. The opportunity to teach during my senior year in high school planted the seed for a fruitful career in education. Teachers have the capacity to grow-our-own. Encouraging students to consider a teaching career begins in kindergarten and continues through 12th grade. Teachers hold the solution to cultivate and mentor the next harvest of teachers to make our garden grow. Dr. Kathleen Wagner is an Assistant Professor of Educational Studies and Secondary Education at Eastern New Mexico University. She teaches courses on curriculum, instruction, and assessment, supervises teacher candidates during student teaching, and serves as the Assessment Coordinator of the College of Education and Technology. She is also the counselor of the Omicron Upsilon chapter at ENMU. Stories about hard work and perseverance are uplifting and give hope to others. While those stories are inspirational, they often focus on only one side of the story—the student. As a student, I was a diamond in the rough, but the other side of the story is that I owe my success to a nontraditional high school, my high school principal, and a teacher who saved my life. The odds were against me. I was born into poverty and throughout my elementary years, I changed schools at least twice per year, every year. By eighth grade, I had given up on education; I did not care about grades or school. I started failing classes and, ultimately, ended up repeating eighth grade. I continued to switch schools often, as I jumped back and forth between divorced parents. During my ninth-grade year, I left home. I met a boy, became pregnant, and my parents no longer welcomed me. Luckily, I moved in with his family and, for once in my life, had a steady home. I continued in school, but faced new obstacles. I was 16 and needed to work to support my family. I was juggling high school, a family, and working 30+ hours a week. In tenth grade, it all became too much for me and I dropped out of high school—lowering my odds of success even more. I was a statistic. I knew there had to be a better way. I soon learned about an alternative high school for kids just like me. Little did I know this high school and the staff would be my saving grace. The school was located in a portable building and had approximately 20 students, with one principal and four teachers. The “go at your own pace” format allowed students to work and attend school part time. Students completed modules to obtain a basic high school diploma. The staff made the high school effective. Mr. Finley, our principal, provided moral support and words of wisdom to build our confidence. He helped find scholarships and encouraged community college. He personally called if we missed school to make sure everything was okay and to offer transportation. He built trusting relationships with the students, and we knew that when times were rough, Mr. Finley would say the right things to help us get over the hump. Ms. Baker, one of my teachers, excelled in relationship building. She monitored our progress and encouraged with incentives. She stocked the refrigerator with snacks and sodas for us to purchase. When someone earned credit, Ms. Baker rewarded them with a coupon for goodies in the refrigerator. We met with her often to discuss progress and, when students were within one credit required for graduation, Ms. Baker baked a cake to celebrate their success. We were a family at that little school. We counted on Mr. Finley and Ms. Baker for more than just academics; they believed in us when others did not. They offered kindness, love, and support that made learning enjoyable. The last time I saw them was a warm May evening when I proudly strutted across the stage in a purple cap and gown as my name was called aloud. I wish they could know that was not the last time I walked across the stage. I strutted across three more times for undergraduate and master’s degrees. In May 2018, I will walk across a stage once again, dressed in velvet regalia as I am awarded a doctoral degree in education. I want Mr. Finley and Ms. Baker to know that without them, this would not have been possible. I am forever grateful for their love and support. Nicole Koch is a first-grade teacher in Central Texas. She is currently finishing a doctoral degree in educational leadership at the University of Mary Hardin–Baylor. Among her research interests is student preparedness in the 21st-century workforce. At Kappa Delta Pi Headquarters, we tend to care deeply about our members. Sometimes, that means we go a little above and beyond the usual customer service relationship. 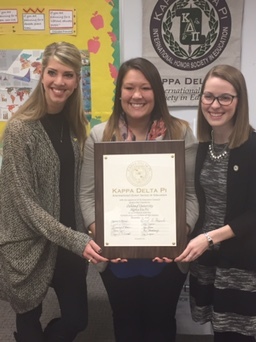 Recently, staffer Thomas Ulmet worked with Oakland University to install their brand new chapter of KDP. The relationship he formed with the new officers opened a door to be part of a very personal event in the life of the new chapter president. Chapter Vice-President Katie Juronoc asked Thomas for a “random favor” a few weeks before the chapter installation ceremony was to take place. 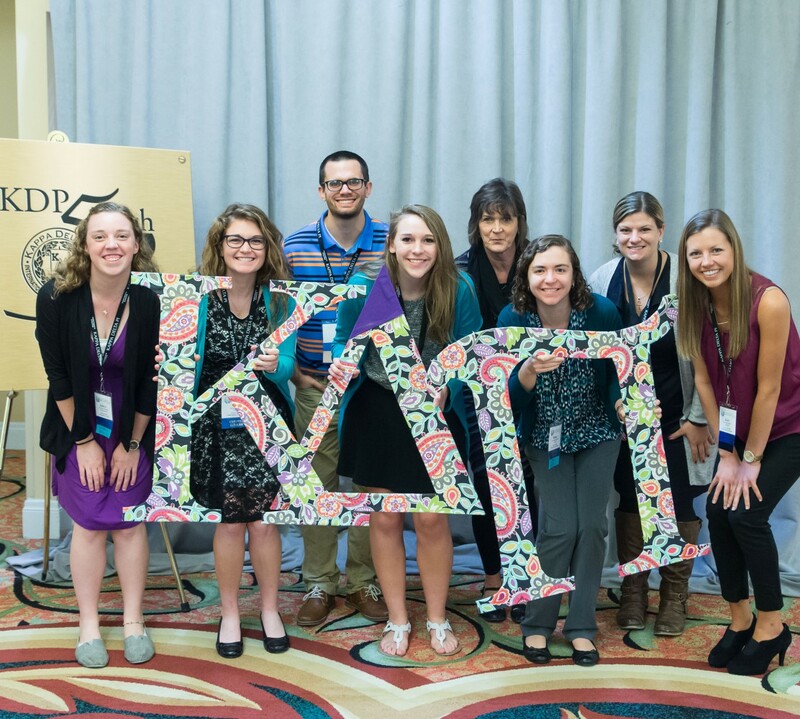 That favor turned out to be a big surprise for Chapter President Karie Czapski. 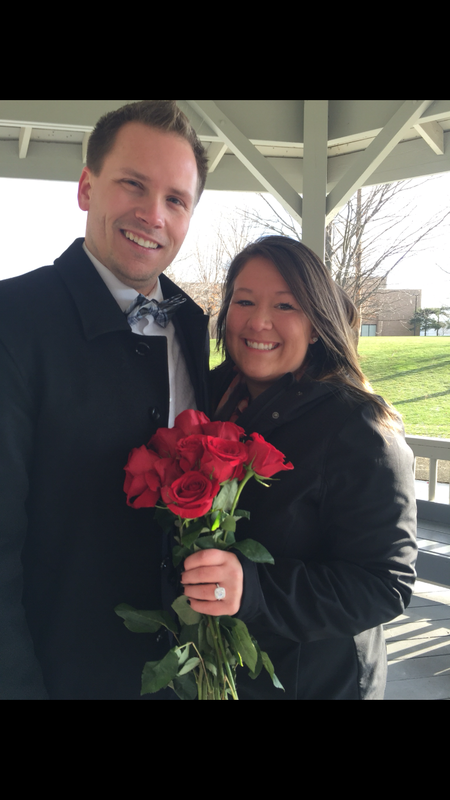 It turns out Karie’s boyfriend needed assistance in his plan to pop the question, and KDP came to the rescue. Through maneuvering and subterfuge, Thomas and Katie arranged for Karie to show up at the spot where she met her boyfriend, all under the pretense that she was to present a KDP Informational Meeting to potential new members. Karie, always prepared to serve and promote KDP, dressed in her business attire and showed up with presentation ready to go. Instead she was presented with a ring and a proposal. Has your involvement with KDP brought you similar joy and happiness? Share your story!